This is one of the funniest books I've read in a long time, and at the same time sad and anxious throughout most of it. At least it has a happy ending. Also, you don't have to live in the L.A. area to appreciate this book. Though if you've ever visited there or know someone who lives or has lived there, particularly in Tujunga or any other such town in the area around LA, you'll do mental double-takes about every page or two. And here's another thing: Why was this published in 1997 but I'm just now reading it, 21 years later, and enjoying it this much? It's totally (TOTALLY) up to date, with the attitudes and conversations and everything that happens, and even some of the names are still recognizable. The author, Sandra Tsing Loh, is absolutely brilliant. I'm sending my copy to a friend who lives in LA and works (and used to work) in Tujunga. Don't worry, Friend, you don't even have to read the whole book. Or any of it. Just glance at the first page, and you'll see what I mean. I skimmed through it super fast so I could get it in the mail today, and still got the gist of it. 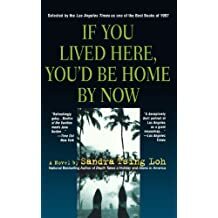 I can guess the title comes from a banner that hung for years on an apartment complex near Tarzana (I think) that said, "If you lived here you'd be home by now." I used to drive by that complex - and banner - twice each day during my 60 mile commute (one way) and longingly muse how right it was. Which is why I moved so I'd have a four mile commute to work instead.